Hiya All !! Prash from Pune, India. Google just released a Google Font API & Google Font Directory. Google Buzz id now live !! After you login into your gmail account your should see the Buzz icon on your left hand side menu. Quick… Check out http://www.verryindia.com/ now! Yes, that’s right, it’s VeRRY with 2 ‘R’ s, to emphasise ‘Indianness’! 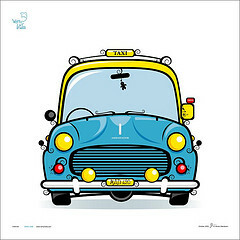 Started by Vikram Nandwani, these are a set of cartoons, illustrations, sketches, wall art & murals which are available as Limited Edition Digital Prints, signed by Vikram in the following sizes: 10″x10″, 20″x20″ & 40″x40″. They truly reflect everything ‘Indian’. My favourite one from the Verry Indian collection is the Ambassador.